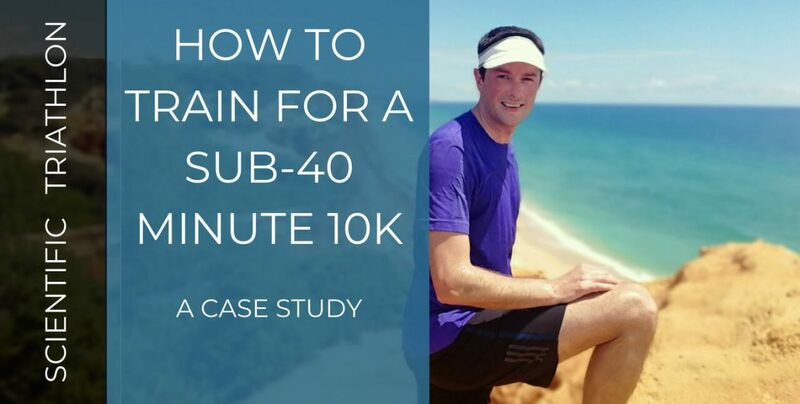 This case study shows how Adam took more than 5 minutes off his 10k run personal best, going from 45 to 40 minutes. Adam, 40, UK, has a wife, two young kids and a demanding job with significant travel. His goal was to take more than 5 minutes off his post-twenties 10k run personal best by the end of 2017, and go from a 45-minute 10k to a sub-40, starting in late October. A challenging task, especially given the fact that his current training indicated at best being able to reach 42 minutes or so. On New Year’s Eve 2017, Adam solo time trialled a 10k run on the track. The result? A fantastic 39:54! Let’s uncover the training that got him to this goal. Using technology to track data is incredibly easy in today’s day and age. Most triathletes use GPS-watches, heart rate monitors, mobile apps, and other gadgets to track and monitor all sorts of data on their training, racing, and general health. But tracking and monitoring data is one thing. Using the data to drive your decisions about how to train and race is a different story. Knowing how to filter and decipher all the information that you have can be difficult and confusing. Focus on the wrong metrics and numbers, and your training is likely to stagnate, or worse, you might get yourself injured or overtrained. Those triathletes and coaches that do learn how to effectively use data stand to gain massive advantages. The opportunities are almost endless, and will only become greater in the future. You can learn exactly when you need to push or back off your training, how to plan your training to peak perfectly in time for a race, when to move on from one training phase to the next, and so on. In short, triathlon is at a crossroads where those not embracing and mastering data-driven training will inevitably get left behind their data-savvy competitors. In this article you’ll learn about 11 high return on investment ways to use data to improve your training and racing performance. I’ll show you specific examples of how I use data-driven training in my own training and for athletes I coach. Feel free to copy my methods exactly, or adapt them to suit your needs. For decades, swimmers and triathletes have been taught the importance of pushing through the swim stroke to the very end. Conventional wisdom says that your hand should push past your hip exit the water next to your thigh. Until recently, I’ve never questioned that. But that changed during one of the sessions of the Global Swimming Summit (check it out, there were tons of excellent presentations). In one of the keynote sessions, World champion, International Swimming Hall of Famer, and swim technique guru Karlyn Pipes presented several compelling arguments for why this conventional wisdom may be false and why triathletes should get rid of this catch-killing long stroke. In this article you’ll get a summary of the points that Karlyn made in her presentation. In addition to a new perspective on the push phase of the stroke, you’ll learn about Karlyn’s take on hand entry and rotation. In both cases it differs from what traditional schools of thought would have you do. If you’ve always swum the traditional way, I encourage you to try out this alternative approach and see whether it works for you. You’ve pushed yourself hard, spent months upon months following a strict half Ironman training regimen, and are trying to adopt the healthiest lifestyle possible. You can swim, bike and run with speed and stamina. But why, then, do you still feel yourself falling flat? Many 70.3 triathletes actually stagnate in their performance or even go backwards. The truth is, you may be making some simple mistakes that are costing you big time. Consider these 7 common mistakes and if you can identify just 2-3 ways to improve, your performance will dramatically improve again. Cheating on doing proper bike maintenance regularly can cost you money down the line with more expensive services by bike mechanics and can result in decreased bike performance. This article will help you knowing what bike maintenance to do, when to do it and how to do it. And believe it or not, but once you get the hang of it, it can actually become a pretty fun part of your triathlon cycling experience! Today’s bonus download is the two checklists that I use personally to keep on top of my bike maintenance: one for quick and easy weekly maintenance and one for more careful monthly maintenance. Do you find running a pain in the rear end? You’re not alone. Many triathletes find the final leg of triathlon a big challenge. Which isn’t surprising at all, given the fact that running is difficult. In this article, you’ll learn why running for all its simplicity can be so damn hard. And you’ll get 11 tips that will help you improve your running. Five of the tips are geared towards beginners, and five are for more advanced runners and triathletes. The bonus tip #11 applies to every single triathlete on the face of the earth and you must not under any circumstances skip applying it in your training. There’s a lot more to triathlon cycling than just riding your bike. And cycling for triathletes is not the same as it is for cyclists. That’s why I decided to write a series of Triathlon Cycling Tips articles. This is Part 1, and today we dive deep into equipment and gear for triathlon cycling. Every triathlete, including beginners, should be aware of this information. It’ll help you know what you might want to buy, but also what you shouldn’t throw your money at just yet. Use the navigation menu below to go directly to any one of the 18 topics you want to learn more about. There’s also a bonus download with my top-5 resources when it comes to triathlon cycling gear. I highly recommend you download it. These resources have saved me countless times when I’ve had questions or issues with my bike equipment. Open water swim training is fantastic. It’s fun, it’s beautiful (often), and it develops race-specific swimming skills. But it can be a difficult, if not impossible, logistical puzzle for busy triathletes to fit open water swim sessions in their busy calendars. Not to mention that some triathletes may not even have access to a body of open water to train in. That’s where open water swim training in the pool comes to the rescue. Most of the skills you need on race day can be practiced to at least some extent within the confines of your pool. If you want to improve your swim performance on race day but for any of the reasons above you’re not able to do much open water swim training, then read on! You’ll learn about five specific skill sets you’ll need on race day that can be practiced in the pool almost as well as in the open water. Let’s take a look at how you can train each of these skillsets in the comfort of your pool, to ultimately become a better open water swimmer and triathlete. Would you be interested to hear about a way to shave a lot of time off your next race? And that will make the probability of you finishing the race that much higher? And that requires no extra training? Then listen up. A solid race plan can do all of that for you. Yet most triathletes skip this crucial step. Unfortunately, many of these triathletes end up leaving time on the course or even quitting the race because of it. So with that in mind, this post is all about how to create a triathlon race plan. You will learn when to create it, what it should contain and how having one will most definitely help you in you race, whatever your goal.